Publishing pre-law news, events & opportunities every Monday and Wednesday! 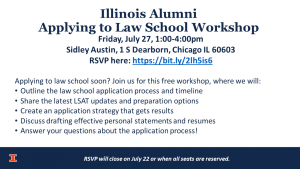 Illinois Alumni, we’re coming to Chicago for a special Applying to Law School workshop we created just for you! Did you know that more law school applicants are applying 1-3 years after graduating from undergrad than students who are going straight through to law school? Entering law school after a “bridge year” or years has become the norm. 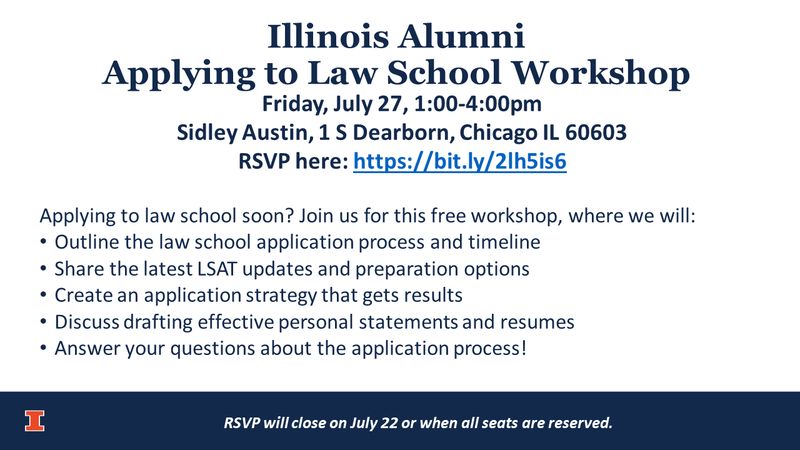 We created this free workshop in order to better reach our alumni who are planning to apply to law school in the next year or two and no longer live near campus. Join us! Click here to RSVP. We will accept reservations until the workshop is full or July 22. The June LSAT is almost here. Of course you have been studying diligently and are ready for what is coming on the LSAT. But don’t forget — the LSAC has a list of rules and procedures to follow for the day of the test. Here are a few reminders and tips to help test day go smoothly! What must you bring? To be eligible to take the LSAT, you will be required to have with you at the test center the printout of your admission ticket that includes the photo that you uploaded through your LSAC online account. Admission tickets that do not display the required uploaded photo will not be accepted on test day. You must also bring a valid, government issued photo ID and 3-4 sharpened sharpened No. 2 or HB wooden pencils with good erasers. Remember that mechanical pencils are prohibited. What can’t you bring? The LSAC has a list of LSAT test day prohibited items that includes cellphones, backpacks/handbags, digital watches, fitness tracking devices, headphones, hats, sunglasses, and many others. NOTE: LSAC has adopted a no-tolerance policy with regard to the use or possession of electronic devices (including cell phones) during the administration of the LSAT. Consequently, test takers discovered in possession of (or using) any electronic device, will be issued a Violation of Law School Admission Test Center Regulations form and will be dismissed from the test. Such violations will be grounds for score cancellation, and you may be subject to an LSAC investigation. This policy will be enforced from the time test takers arrive at the test center until they leave at the conclusion of the test—including the break. Remember to review the LSAC’s Day of Test reminders to avoid making a critical mistake! http://www.lsac.org/jd/lsat/day-of-test. In addition to LSAC’s rules, here are some tips and reminders to help your test day go smoothly! Get several nights of good sleep. It’s normal to be anxious the night before, and having a few good nights of sleep before test day will help. Eat lunch and bring a snack and drink even if you don’t think you’ll need it. The test is long, and your brain will want that fuel. Make sure you print out your test ticket, locate your government ID, get some non-mechanical pencils, and pack your plastic bag of allowed test items the night before. Scope out the location before test day. Drive there or take your public transportation route if you can. This way you will know where to find parking or you can estimate how long it will take to walk from a train station. Figure out what you’ll do with your backpack, handbag, and your cell phone because you cannot bring these items in with you. ARRIVE EARLY. Give yourself plenty of time to check in, use the restroom, and get settled before the test begins. Test sites do not allow late arrivals. For more info on LSAT options, including cancelling your score after the LSAT or retaking, check out this post. June and July LSAT takers, are you scoring what you need to on your prep tests to be competitive at your list of law schools? (You can use the LSAC’s GPA/LSAT Search here to help estimate your likelihood of admission based on how you are scoring.) As we approach each of these exams it is important to know all of your options if you’re not feeling ready or if you know during the test that it’s not going well. Let’s talk about withdrawing, cancelling, and retaking. Withdrawing. LSAT registrants can withdraw until the day before the exam. Registrants who withdraw will lose their test fees but the withdrawal will NOT be noted on your file and will NOT be seen by law schools when you apply. If you aren’t quite ready for this LSAT then withdrawal might be a good option. If you are withdrawing from the JUNE exam, you could register for the July LSAT instead until June 13. However, you should note that the July LSAT is nondisclosed, so for that test you will only receive a score and you will not see which questions you got right and wrong. If you are withdrawing from the JULY exam, you could register for the September LSAT instead until July 23. You may be assigned to a different test site depending on availability of seats. You should continue your LSAT prep and make a realistic plan for how to use the remaining weeks until your next exam. Advice for those who make this choice: DO NOT PROCRASTINATE. Once the pressure of the next LSAT is off, you will be very tempted to put your LSAT materials away and relax. DO NOT DO THIS, or you will find yourself in the exact same state of panic if you realize you are not ready for the next exam either. Use this summer wisely, and take the time you need to be fully prepared for this exam. Cancelling. Know that you can cancel your LSAT score within 6 calendar days of taking the exam. In the unlikely event that your test day is a disaster (like you have a migraine, you accidentally mis-bubble a whole section, or you have an asthma attack during Logic Games), this is a good option. You won’t know what score you received, which means you’ll need to retake, but there is some benefit to taking a “real” LSAT to make you feel less anxious the next time around. Advice to those who choose this option: Follow the LSAC instructions carefully, as you only have 6 calendar days to cancel. (Click here for instructions.) Since you know you will be retaking, register and get back to your LSAT study prep right away–you’ll want to use all of that time to prepare. Retaking. Most LSAT takers want to see their score before deciding to retake, since every LSAT score gets reported to every law school to which you apply. The challenge here is with timing. June scores will not be out until the July test registration is closed, making September the next test available to June LSAT takers, and the next test available for July LSAT takers who wait for their scores will be November. Advice for this situation: Plan ahead to know when the next available exam will be, and then register ASAP once you receive your score. Note that all LSATs through January 2019 are already open for registration, so many test sites may be full. The sooner you register the more likely it will be that you get a seat and get it at your preferred test site. Then, get right back to your LSAT prep so you don’t lose any ground.